Myelofibrosis is a disease of the bone marrow that causes the marrow to become fibrotic, or scarred. The scar tissue forms inside the blood-forming marrow tissue, in the hallow cavities of certain bones. The “scarring” in myelofibrosis, however, is unlike the scarring resulting from a healing skin wound. Bone marrow is the site of production for all of the body’s blood cells, and so a scarring process that starts there is not benign, and it can eventually lead to problems with cell counts, serious complications and shortening of the life span. When fibrosis takes over, this leads to worse and worse blood cell production, with abnormalities in the cell counts and sometimes in the blood cells themselves. Ultimately, in advanced myelofibrosis, this may cause the marrow to fail in doing its job altogether. When myelofibrosis progresses or evolves, life-threatening complications such as leukemia and serious blood clotting and bleeding events are possible. It is also possible for myelofibrosis to lead to acute leukemia, a life-threatening blood cancer. Myelofibrosis can be primary or secondary. When it arises anew, or is detected all by itself for the first time, it is called primary myelofibrosis. When it develops in association with some other disease, injury or blood condition it is called secondary myelofibrosis. For example, myelofibrosis after a blood disorder known as polycythemia vera is one form of secondary myelofibrosis. Is It the Same as Cancer? It has many things in common with cancer, but experts refer to it as a “myeloproliferative neoplasm.” To keep things simple, the word neoplasm can be thought of as a fancy term for “tumor or growth” and tumors or growths can be benign or malignant. Myelofibrosis is definitely not benign, but it also lacks some of the characteristics people have come to expect when thinking about cancer, or malignant neoplasms. That said, whether you look at myelofibrosis as a cancer or a harmful growth of the bone marrow tissue, there is currently no drug therapy that is curative (but bone marrow transplant can be curative), and it is a process that can progress to cause harm—albeit at different speeds in different people. Advanced forms of myelofibrosis limit the life span and create a significant health burden for patients. You will find plenty of patient-geared sites that refer to myelofibrosis as “a rare blood cancer.” This may be an efficient way to communicate the general concept, but there is also more to the story. Myelofibrosis can lead to blood cancer, but in some cases, myelofibrosis may result from blood cancer. Besides primary and secondary, there are other ways to categorize myelofibrosis. One way is to group cases of this disease into separate risk categories depending on a person’s findings when the disease is first diagnosed. Several different tools are available to help doctors determine your level of risk, to help guide treatment and to shape your prognosis. According to the Leukemia & Lymphoma Society, myelofibrosis occurs in about 1.5 out of every 100,000 people in the United States each year. It affects both men and women and is usually diagnosed in people over the age of 60, but it can occur at any age. It’s estimated that about 16,000 to 18,500 people in the United States have myelofibrosis. Multiple types of marrow cells and genes are known to be involved, however , the precise cause of the excessive scarring in myelofibrosis is not entirely clear. Many genetic and chromosomal abnormalities have been found, including a mutation called the “JAK2 V617F missense mutation,” however having this mutation does not mean you will necessarily develop primary myelofibrosis. The reason for such mutations is unknown, and no specific exposures or risk factors can be linked to primary myelofibrosis in most cases. In addition to blood cancers, other non-cancerous blood disorders known as “myeloproliferative neoplasms” such as polycythemia vera and essential thrombocythemia may also to lead to secondary myelofibrosis. Secondary or interactive myelofibrosis can also occur in response to chemical or physical injury, infection or loss of blood supply to the bone marrow. Primary myelofibrosis, polycythemia vera–related myelofibrosis, and essential thrombocythemia-related myelofibrosis are all sometimes lumped together as “myelofibrosis,” but scientists say there may be more to learn and understand about differences between each type. The bone marrow failure can lead to symptoms from low blood counts, such as fatigue from having too few healthy red blood cells. The impact on blood platelets can also lead to bleeding and clotting problems. Normally, blood cell production shifts to the bone marrow in babies at or around the time of birth. Prior to birth, however, babies can produce new blood cells at sites such as the spleen, liver, and lymph nodes—these sites outside the bone marrow are called extramedullary. Normally in adults, the only site of new blood cell formation is the bone marrow. In certain blood cancers and blood disorders, people go back to producing blood cells wherever they can, at these extramedullary sites. In myelofibrosis, this most commonly occurs in the spleen and liver. Sometimes a person’s spleen can become huge because of extramedullary hematopoiesis in myelofibrosis. Major complications of myelofibrosis generally come from the bone marrow failure and extramedullary hematopoiesis. There is an increased risk of transformation to acute myeloid leukemia (AML) with myelofibrosis, and about 20 percent of people with myelofibrosis develop acute leukemia. In addition to the information your doctor gets through your symptoms and physical exam, there are several tests that offer valuable diagnostic information. 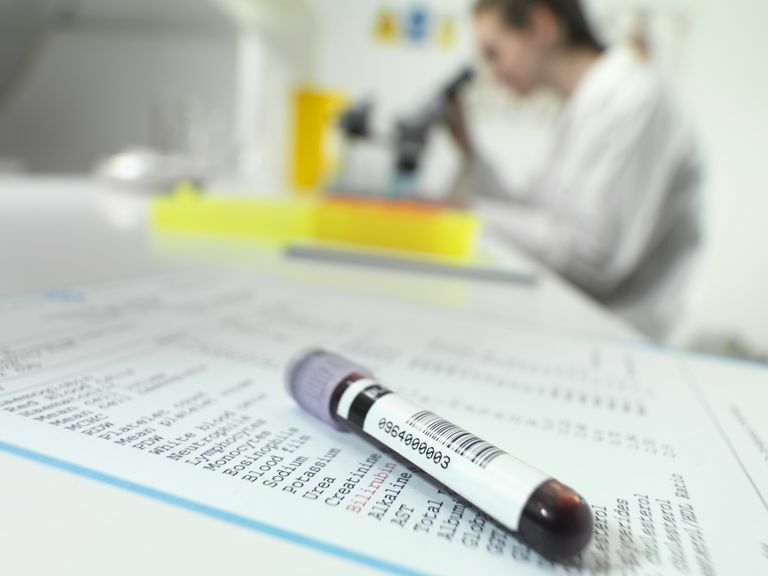 These include blood counts, other blood work, imaging tests such as x-rays and MRI, bone marrow tests, and gene tests. A sample of blood or bone marrow may be sent to the laboratory to look for gene mutations (such as the JAK2, CALR, or MPL mutations) that are very often present in people with myelofibrosis. Other things that can look like myelofibrosis, but are not, include chronic myelogenous leukemia, other myeloproliferative syndromes, chronic myelomonocytic leukemia, and acute myeloid leukemia. Currently, there is no drug option that is curative. The goal for most patients is to relieve symptoms, reduce an enlarged spleen and improve blood cell counts. In concert with these goals, the overriding goal is also to reduce the risk of complications. Myelofibrosis is a disease with few approved treatment options, but many new agents are being investigated and developed. Treatment is guided by your specific factors such as the presence of symptoms, as well as the risk of your particular case of myelofibrosis, and also on your age and overall/general health. For people with very low risk and no symptoms, observation alone may be fine. For high-risk disease, stem cell transplant from a donor is often considered, but not all patients are eligible due to the risks. Some patients are good candidates for conventional drug therapy or investigational drug therapy in a clinical trial. In 2011, the Food and Drug Administration (FDA) approved ruxolitinib (Jakafi) for the treatment of intermediate and high-risk myelofibrosis, including primary myelofibrosis, post-polycythemia vera myelofibrosis, and post-essential thrombocythemia myelofibrosis. The FDA approval was based on the results of two randomized controlled trials in patients with intermediate or high-risk myelofibrosis comparing ruxolitinib to placebo (Study 1) or to best available therapy (Study 2). In Study 1, 42 percent of patients treated with ruxolitinib, compared with 1 percent of patients treated with placebo, experienced at least a 35 percent reduction of spleen size at 24 weeks. At the time of approval, 75 percent of the patients on Study 1 and 67 percent on Study 2 who achieved at least a 35 percent reduction in spleen volume maintained this reduction in spleen volume. Ruxolitinib is effective in reducing spleen size and alleviating symptoms in a majority of patients. In the clinical trial testing ruxolitinib in patients with high-risk myelofibrosis, a large group of participants had significant improvement in symptoms associated with the disease: they wrote a daily diary capturing the debilitating symptoms of myelofibrosis which included abdominal discomfort, early sensation of fullness, pain under left ribs, itchiness, night sweats and bone/muscle pain. The most common adverse drug reactions, observed in at least 1 percent of the patients treated with ruxolitinib, included low platelets, anemia, bruising, dizziness, and headache. Adverse drug reactions of a threshold severity that were higher in patients treated with ruxolitinib compared with placebo in Study 1 included low platelets (experienced by 13 percent of patients treated with ruxolitinib, compared with 1 percent of patients treated with placebo) and anemia (experienced by 45 percent of patients treated with ruxolitinib, compared with 19 percent of patients treated with placebo). Similar results were observed in Study 2. Other therapies found to be effective for enlarged spleen and control of symptoms include chemotherapies, removal of the spleen or splenectomy, and low-dose radiation therapy to the spleen. Blood transfusions may be given for anemia, and for patients who have transfusion dependent anemia, bone marrow-stimulating drugs such as erythropoietin, androgens (for instance, danazol), and immunomodulators (for instance, lenalidomide) may be used. Based on past studies, some groups of people diagnosed with myelofibrosis lived for many years, while in other groups, survival times were less than 3 to 5 years from diagnosis. About 60 percent of patients with primary/idiopathic myelofibrosis live 5 years. There is a significant group of patients, however, who live 10 years or more. Those who tend to do very well include those whose hemoglobin levels are greater than 10 g/dL, platelet counts greater than 100x3/uL and those who have less enlargement of the liver. Spleen size and gender do not seem to have any major impact on survival in studies, although in theory, reducing spleen size could translate to survival benefits in some cases. So far, the survival of people with primary myelofibrosis seems to have more to do with their individual symptoms and manifestations of the disease at the outset, and is not as much influenced by any one treatment or therapy; however, this is a concept in evolution that may change as the science unfolds. Newer treatments are continually emerging and the science in this area is expanding rapidly. Myelofibrosis: New Insights for the Healthcare Professional: 2013 Edition. ‪ScholarlyEditions, Jul 22, 2013. Gangat N, Caramazza D, Vaidya R, et al. DIPSS-plus: A Refined Dynamic International Prognostic Scoring System (DIPSS) for Primary Myelofibrosis that Incorporates Prognostic Information from Karyotype, Platelet Count and Transfusion Status. J Clin Oncol. 2011; 29:392-397. Greenberg PL, Attar E, Bennett JM, et al. Myelodysplastic Syndromes: Clinical Practice Guidelines in Oncology. JNCCN. 2013;11(7):838-874.